We run Adidas and Nike shares through a three-part analysis to determine which athletic stock appears more attractive today. 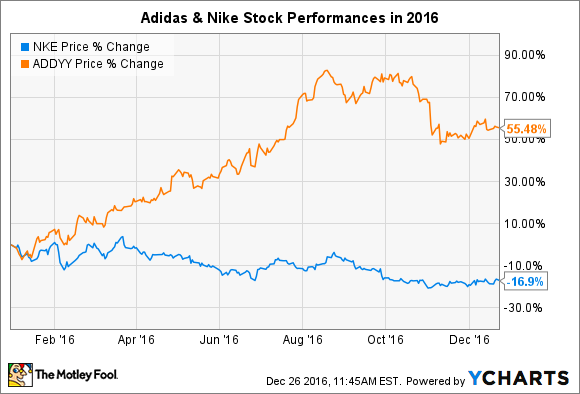 Rare is it to beat the king at his own game, but that's exactly what Adidas (NASDAQOTH:ADDYY) has done to Nike (NYSE:NKE) over the past year. As you can see below, Adidas stock has simply trounced Nike shares as 2016 concludes and 2017 begins. At the same time, Nike's position atop the global athletic apparel and footwear market still goes without question, unfortunately for Adidas. So in the here and now, which companies' stock is the better buy today: Nike or Adidas? In this article, we run Nike and Adidas through a three-part analysis to gain a better sense of which company is more deserving of investors' attention today. As two of the most globally recognizable brands in the world, it should thus come as no surprise that Nike and Adidas both operate from a place of sound financial footing. As the chart below indicates, investors in Nike and Adidas can indeed sleep soundly at night knowing each company appears to have its financial house largely in order. Data source: Nike & Adidas Investor Relations, Yahoo Finance. In terms of comparing the two, Nike clearly bests Adidas in each of the above categories, though that shouldn't necessarily come as a huge surprise. We'll dig into this further in the next section, but Nike's size advantage manifests itself in the company's superior liquidity measures. Unsurprisingly, Nike and Adidas enjoy nearly identical gross margins, though Nike's sales base is roughly twice the size of Adidas' sales. This sales difference gives Nike an operating leverage advantage that allows the company to generate more profit on each dollar of sales than Adidas, which translates into more cash in the bank for Nike and its investors. Alongside Baltimore-based Under Armour (NYSE:UAA) (NYSE:UA), Nike and Adidas sit atop the global athletic footwear and apparel market, a space that continues to blend with the fashion and consumer goods industries; Nike was the most mentioned fashion brand on Instagram in 2015. Based on any metric -- sales, profits, market share, etc. -- Nike remains the undisputed king of the space. However, with Adidas and Under Armour each executing their own growth strategies to great effect in recent years, the real question in this space has become: Can Adidas and Under Armour make the global apparel and footwear markets into a three-horse race? The evidence seems to suggest so. As evidenced by the impressive rally in its shares this year, Adidas has managed to reposition its products, marketing, and organizational structure that together make a challenge to Nike's dominance seem achievable. On the product front, Adidas has refreshed its core sneaker lineup with hit sneakers like its Boost shoes, while also adding fashion-forward collaborations with celebrities like Kanye West, which have helped add a new aura of cool to the European brand. Adidas has also helped bolster the brand with timely endorsements deals with athletes like NFL players Von Miller and Aaron Rodgers, NBA superstar James Harden, budding MLB sensation Kris Bryant, and many more. Together, these efforts helped Adidas' share of the U.S. athletic shoe market increase from 4.3% at the start of the year to 7.2% by November. Before this year, Adidas had lost market share in the all-important U.S. shoe market every year since 2011. Furthermore, Adidas credits much of its success this year to overhauling its organizational structure to reduce friction between its German headquarters and its critical U.S. operations. Clearly, Adidas has discovered a winning playbook that resonates with consumers. However, Nike's advantages are numerous and should not be taken for granted. Though much of this discussion has focused on Adidas' successes, the important context is that it has succeeded in clawing back against Nike's formidable market leadership. Though it nearly doubled this year, Adidas' 7.2% of the U.S. athletic shoe market still pales in comparison against Nike's 37.3% market share. That's a chasm-like gap, one that will take Adidas or Under Armour a generation of excellent execution to close. What's more, Nike remains every bit as invested in remaining at the forefront of the athletic shoe and apparel markets. In response to brands like Lululemon and Under Armour, Nike has begun more actively courting female consumers, a segment it has historically under-pursued. It is also investing heavily in China, and its iconic marketing engine shows no signs of slowing. So while Adidas has indeed achieved impressive results, it still remains far behind Nike in terms of its own durable competitive advantages. Turning to the trading multiples for Adidas and Nike, the analysis becomes pretty straightforward as you can see below. The numbers don't lie. Nike and Adidas have fairly similar valuations across their current P/E, forward P/E, and EV/EBITDA ratios. Interestingly, Adidas' more expensive valuation based off its 2017 estimated earnings implies that the investing community sees Adidas as growing faster than Nike in the near-term. However, rather than dwelling on the relatively minor discrepancies between the two, the more substantive, big picture takeaway is that Nike and Adidas are both valued as established companies with moderate future growth prospects. Indeed, Adidas deserves praise for reviving a rivalry many viewed as having faded into a clear victory for Nike. From here, the key question seems to be whether Adidas can parlay this year's victory into continued success. It certainly lies within the realm of possibility. However, in the absence of much more evidence, Nike's enviable competitive position will certainly make doing so an uphill battle for Adidas, which makes Nike the overall better stock to own today.